Timelines are a staple in social studies and ela. They help students keep track of dates and facts. I have been searching for a good online-timeline creator for a while. I have tried Dipity which is good but I find that it is very slow to load and is limited to the number you can create and information mediums. So I searched and searched for an alternative and lo and behold I found Meograph. Not only is it free (YAY!) it can embed videos, text, audio, and uses Google Maps. I was in heaven. I did this with a class and it went smoothly. Well almost smoothly (internet went down once). 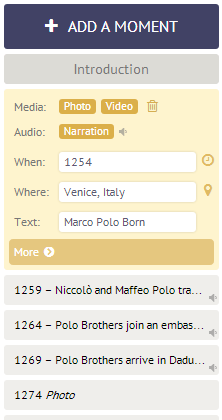 As you can see at the left you can add an event, then a when (date), where (location), link (with more information). You can also add a photo, youtube video, and even narration. The narration online is limited to 30 secs. However, you can upload unlimited audio. I used Audacity (remember you need the LAME encoder to save as MP3) and had the students record and publish as a MP3. A note on location: You must use the current name of the city or town. Therefore if you are talking about Ancient Persia you need to find the modern country.